Star-News 91, Tribune 81: Michelle Miller scored 39 points en route to earning Star-News team MVP honors and the Star-News proved stronger down the stretch to up its series lead to 6-3. The game was tied at 74-74 with 5:40, but big 3-pointers by Monrovia’s Gina Henderson and Miller helped the Star-News pull away. Diamond Ranch’s Chelsea Barnes scored 22 points and was named Tribune team MVP. Star-News/Tribune All-Star Game beginning at 4 pm at Damien High today. Boys game approx. at 6 pm. Above: Pasadena coach Tim Tucker huddles with Star-News All-Stars at practice. Girls game, 4 p.m.; Boys game, 6 p.m. Boys: Tribune 98, Star-News 87, Star-News leads series, 5-3. Girls: Tribune 80, Star-News 69, Star-News leads series, 5-3. Jessy Cantinol, Renaissance Academy, Sr.
Vince De Guzman, Renaissance Academy, Sr.
Ali Jabalameli, South Pasadena, Sr.
Javon Shields, South Pasadena, Sr.
Darrell Dansby, La Canada, Sr.
Jeff Briegel, La Salle, Sr.
Jordan Hill, La Salle, Sr.
Michelle Miller, Pasadena Poly, Sr.
Kelsey Nakamura, South Pasadena, Sr.
Sydney Zarate, La Canada, Sr.
Kristin Leung, San Marino, Sr.
Lana Haddad, Flintridge Sacred Heart, Sr.
Devanie Davis, Rio Hondo Prep, Sr. It didn’t take long for Muir High School’s Dion Nelson to work up a sweat during Thursday’s practice with the Star-News All-Star team. It was his first organized practice representing his school since the first week of February. Nelson has not played an organized game since Feb. 10 when the Mustangs lost to Pasadena in their regular-season season finale, 71-53. That’s when Muir found out that it would have to forfeit 20 games and miss the CIF-Southern Section Division 4AA playoffs. Nelson will get a chance to play one more game wearing his high school jersey when he takes part in the ninth annual Star-News/Tribune All-Star Basketball Game at 6 p.m. Saturday at Damien High in La Verne. Nelson, a point guard who earned second-team All-Area honors, does his best to not think about what could have been. It’s easy to get caught up in thinking about Muir’s promising season in which it went 24-2 at season’s end, won the school’s first Pacific League title in over a decade and had a top-50 ranking in the state with a strong chance to go deep in the Division 4AA playoffs, long considered the “Super Division” in which the Mustangs were the only public school team ranked in the top 10. By the time Muir was preparing to play rival Pasadena in the season finale, the hammer had all but fallen on the Mustangs’ program. It would eventually lead to the dismisal of Robert Galvan as athletic director, coach Gamal Smalley’s resignation and principal Sheryl Orange’s demotion as principal at school year’s end. Disappointment and anger are the emotions Nelson tries to avoid, but it’s tough. That was then and this is now, the present that has Nelson back on the court with familiar faces and a future that burns bright. Nelson on Monday committed to Whittier College, an NCAA Division III school. Pasadena’s Blake Hamilton and John Haywood squared off in a scrimmage Thursday. The two were relentless trying to outdo one another, and it seemed like Haywood got the better end of it, dunking over Hamilton on one play. “He didn’t dunk on me, I just got out of the way,” was Hamilton’s response. Hamilton, a 6-foot-5 shooting guard, will make a decision today on whether he’ll attend Hawaii, Cal State Northridge or Northern Arizona. Haywood, a 5-foot-11 guard, will attend Citrus College. Baseball Updates: San Marino beats Monrovia 3-1; Temple City beats South Pasadena 5-1, tied for first in Rio Hondo League; La Salle gets Bishop Amat again, 3-2; Pasadena beats Hoover, 14-6; Arcadia blanks Glendale, 8-0. 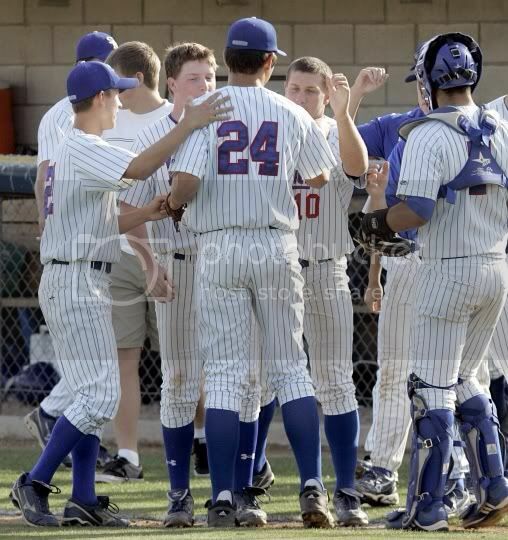 San Marino 3, Monrovia 1: Garret Glazier pitched a gem and Jeff Bain came in relief to record the save. San Marino scored its first two runs thanks to an error, a fielder’s choice and two wild pitches to go ahead 2-0 after the first. The Titans scored their third run in the second on an infield single on a 3-2 count before stealing second and scoring on a base hit to center field to take a 3-0 lead. San Marino turned three double plays, fueling its win. Arcadia 8, Glendale 0: Erik Trask threw a no-hitter and struck out 15 to lead the hot-streaking Apaches in Pacific League play. Girls Hoops: Monrovia’s Gina Henderson impressive. Boys practice at Pasadena High tonight, 6-7:30 p.m.
From half-court passes and no-look passes to crisp, deep three-pointers, Monrovia High School’s Gina Henderson showed during Wednesday’s practice with the Star-News All-Stars why it’s ready to extend its lead over the Tribune All-Stars. The teams will meet Saturday at 4 p.m. in the ninth annual Star-News/Tribune All-Star Game at Damien High in La Verne. The Star-News leads the series, 5-3. Henderson stepped onto the West San Gabriel Valley scene as a sophomore when she transferred from Bishop Amat. She gained attention when as a sophomore scored 39 points in the semifinals of the CIF-Southern Section playoffs against Magnolia. The first-team All-Area selection and Rio Hondo League most valuable player displayed deft passing Wednesday with a soft stroke from mid-range and beyond the arc. She was so impressive Star-News All-Star co-coach Kim Weber (Pasadena Poly) unsuccessfully persuaded Henderson to switch from Cal State Bakersfield to Occidental, Weber’s alma mater. Henderson averaged 20 points, four assists, four steals and three rebounds for the Wildcats this season. In just one practice it became obvious that the Star-News’ strength would be at the guard level, and this was all without Pasadena Poly’s Michelle Miller on the floor, who was limited as she prepares for the Prep League swimming finals. Pasadena’s Megan Rutherford, Muir’s Tahniya Sweatt and Henderson reunited on the court for the first time since playing together as sixth graders with the travel team Pasadena Vikings. Rutherford, at 5-foot-11, gives the Star-News a strong post presence and Sweatt brings athleticism and speed. It didn’t take long to figure out who the best shooters were in practice, so it came as no surprise who was tabbed to take part in the 3-point contest during halftime of the girls game. Monrovia’s Domynyque Johnson will join Henderson and Miller. Baseball: Alhambra on a roll with Briones, Arroyo.